During this past Saturday’s “Lawler vs. Shields” event, Showtime’s mic-man Muaro Renallo announced the return of female MMA sensation Gina Carano. Today, Strikeforce parlayed that news by confirming Carano’s highly anticipated scrap against Cristiane “Cyborg” Santos on August 15th will be for a title belt. Carano was one of the few contracts that Strikeforce was not able to secure from their deal with ProElite. Although she was one of EliteXC’s most popular fighters, she certainly wasn’t compensated like it. Four months after the aqcuisition, the two sides have finally come to terms. Although specifics of her new Strikeforce deal were not released, the organization did confirm they have signed Carano to a multi-fight contract, locking in the MMA beauty for many years to come. 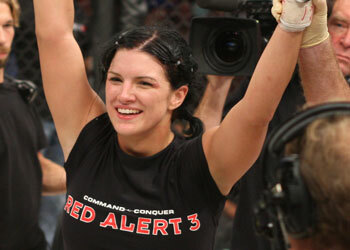 “I’m really excited to be coming back and to have a new home with Strikeforce,” stated Carano. “Strikeforce: Carano vs. Cyborg” will be jumping off inside the HP Pavilion in San Jose, California, with tickets going on sale this Monday, June 15th.